Hello everyone! Today I'm giving you another look at the wonderful Ornament set that was released by Our Daily Bread designs this month, sold completely out, and is now back in stock! This release has just gone like crazy, and who wouldn't want this gorgeous ornament which is made to fit perfectly with the Spellbinder's Heirloom Ornament Die! I used a base of Bazzill, a layer of Real Red and the designer paper is Graphic 45. Love this paper! I added some punch work made with a MS punch on scraps of River Rock sponged with distress ink. The ornament is stamped with Memento Rich Cocoa and colored with Copics. I stamped an extra flower and cut it out to pop it up for dimension, curing the leaves on my piercing tool. The ribbon is from my stash. 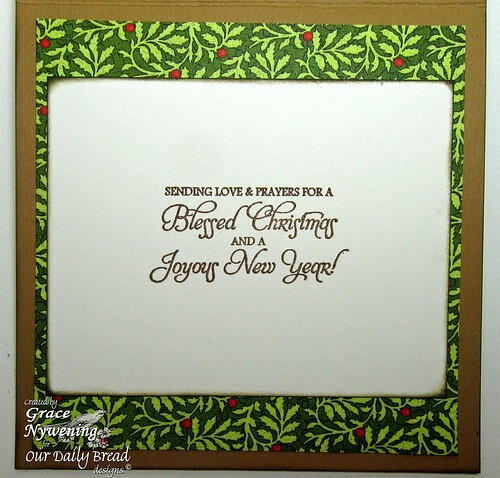 Here is a look at the inside, which uses another ODBD Dec. release... Christmas Blessings, also now in stock. I love this set for how perfectly the sentiments say just what you want to say on the inside of a card! Thanks for looking! I hope you are enjoying this time of the year, looking forward to Christmas and all the wonderful events that surround that day! Thanks so much for stopping! What a gorgeous card, Grace! This should be hung on the wall! Beautifully done, my friend...hugs! This is just beautiful Grace & there's nothing else to say... it's just beautiful! Thanks for joining us at Ccreative Card Crew. Wow, what a beautiful card Grace, love it! Thanks for playing in our challenge at Catch The Bug! FANTASTIC card! Your coloring, layout and embellies are all impeccable! WOW! Thanks so much for joining us at Crafty Hos, AIFactory, and Catch the Bug with Bugaboo Stamps! Hope to see you next challenge! Grace this is stunning girl - inside and out. Gorgeous coloring. Thank you for sharing this beauty with Speedy's Friends. Oh my goodness Grace this could not be more beautiful...elegance to the max....You have out done yourself with this one...TFS!! This is just stunning, I love it! This is beautiful Grace! Thanks for sharing it with us at Penny's. Good Luck & Merry Christmas!! Breath-taking! Just stunning - LOVE everything about your card both inside and out. The ribbon accents and border treatment are to die for. Thanks so much for sharing your creativity with us at Catch the Bug and Bugaboo Stamps. Gorgeous. Love how you doubled up the flower in the middle and that sentiment is wonderful! Thanks for playing with Stampin' Royalty. Thanks for joining us on The Crazy Challenge this week! What a wonderful card Grace,I love the image. So gorgegous papers and the colours. Thanks for playing in Speedy's Friends challenge this week and Happy Holidays! Beautiful card, super image and colours. Thanks for sharing in our 100th challenge at The Crafty Pad this week. This looks great, I love the colours. Thanks for playing along this fortnights at CYDA. This is unbelievably stunning! I love the way you used the ribbon! Thanks so much for participating in Catch the Bug's Anything Goes challenge with Bugaboo Stamps! :D MWAH! This card is just beautiful and I hope you win one of your challenges if not more. This is stunning.Thanks for joining us at DDCC. WOW! This is totally stunning! Thanks for playing with Speedy's Friends! Love this card. It is so elegant. I love the shape of the Spellbinder. Your card is just beautiful. I love this new set and know I will enjoy using it for many years. Blessings! I'm ba-ack. . .;) Thanks so much for working the corner with The Crafty Hos! :D MWAH! Wow!!!! Gorgeous Grace. I love OBD stamps. i wish I had the money to buy them all up! They are blessed to have you because girlfriend you make them shine!! Totally gorgeous!!! Love this so much, Grace!! Stunning! Thanks for joining us this week at Christmas Card Challenges! What a wondefully luxurious card!!! Beautiful. A fantastic card. Its beautiful !! Thank you for sharing with us at OSAAT for our new stash/ old stash challenge. Good Luck !! Hi sorry I'm a little late! What a great card! I just love it! Thanks for joining us this week at The Crafty Ho Blog for our inspiration challenge! Hope to see you again for our next challenge! I am always in awe of your beautiful cards- this one is no exception! Just beautiful! Thanks so much for joining us at the Creative Belli challenge this week! Your card is so elegant. Thanks for sharing with us at Stampin' Royalty. Oh my, this is just exquisite, Grace! The colors are so rich and vibrant and the stamp combined with the Spellbinder's die is just outstanding. Sure to be enjoyed by the lucky recipient! So happy to have you joining in the fun with us this week at Simon Says Stamp and Show. Beautiful ! Thanks for joining us on CCT this week. Gorgeous!!! 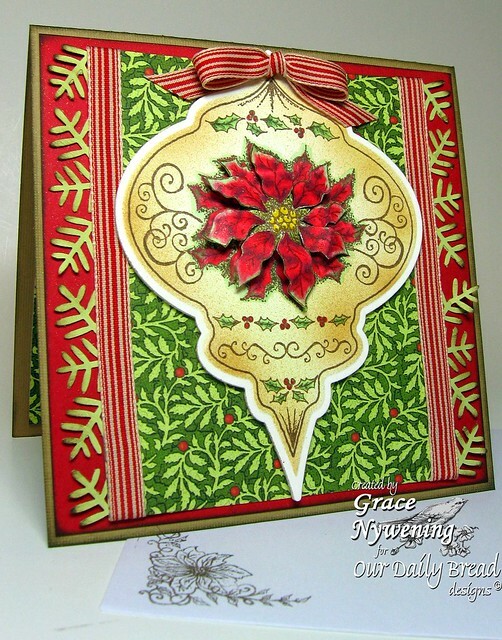 Love the large ornament and the colors - they are perfect for our challenge at Meljen's Design this week! Thanks for playing! Wow, this is gorgeous! So fantastic colors - great job! Great on the outside and the inside! Thanks for joining us at DDCC.